Following the tradition of reliable unpleasantness that is every Monday morning, this past Monday was no different. I was back at the workplace bleary-eyed and draggy-tailed doing what I had not anticipated doing first thing that particularly crummy Monday morning, struggling to open a carton of skim milk at my desk. I had just poured the remainder of the previous week’s carton of milk-flavored water on my cereal, a cup of lightly sweetened organic flakes high in fiberboard. I was intending to add additional milk but this week’s carton proposed battle. It refused to follow the natural law of packaging* of opening to the simple touch. It was clear to me that if this carton possessed a middle digit, it would be aimed in an upward direction at my grimacing face. The Devil's Milk Carton ... possible horror film premise? *I am purposely excluding products held hostage inside hard plastic stroke-inducing packaging and pills ensconced in allegedly child-proof bottles with adult-proof tops, more inventions courtesy of Satan. (not) Under Ling (anymore): Why are you photographing your milk cartons? [light bulb] Do you have Twinkies in there? 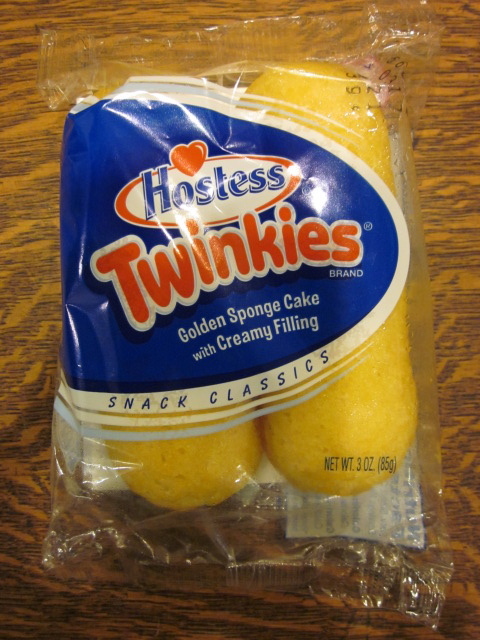 Twinkies on the (not) Under Ling (anymore) mind. Me (through clenched teeth): Tune into Wednesday’s Lame for the answer. One of the minor mysteries of life is why is it that every so often, one draws the short straw and encounters that inner freshness bag that refuses to surrender, the potato chip bag sealed with glue so impenetrable, it requires the intervention of a scissors or a higher power (I’m thinking weapons grade explosive) to open, and lately, paper milk cartons closed tighter than a maximum security prison? 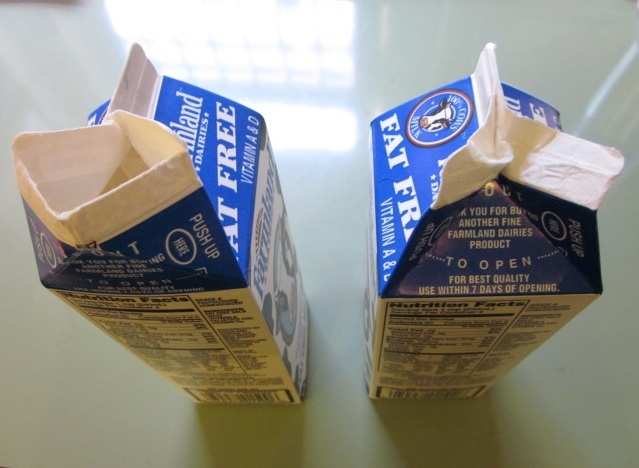 Twin cartons -- easy-to-open conformist on left, open-resistant mope on right. Why is this necessary? Is there something about operating a package sealing apparatus that is catnip to types suffering Borderline Personality Disorder looking for outlets for their hostility? Where is the quality control to prevent defective product packaging? At the very least consumers should be awarded complimentary Valium for brand loyalty when they’re forced to wrestle with these beasts. By the time I was able to tear open that disagreeable milk carton, my cereal was reduced to soggy mush welcoming me to a new week at The Grind. If this milk carton could talk, what might it say? Talking Milk Carton: F.U. This entry was posted in Humor and tagged idiocy, milk carton, office, packaging woes, struggle, stupidity, twinkies. Bookmark the permalink. 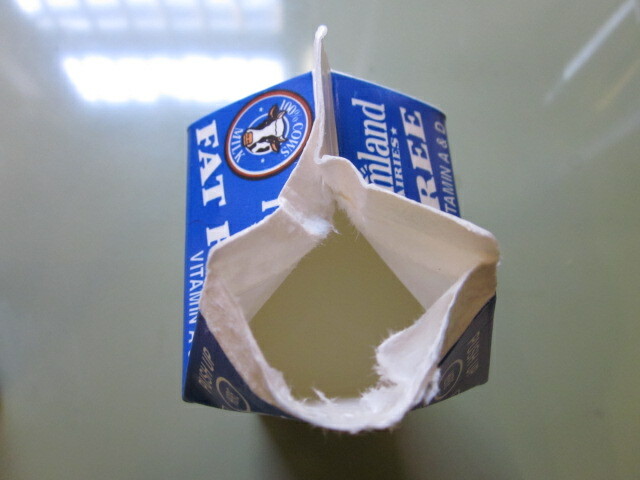 I think we’ve all had the pleasure of dealing with milk cartons from hell. So I don’t want to dwell on that dilemma, but I feel your pain. I believe your exegesis was spot on. What disturbs me more, however, is the fact that you are reduced to: 1) eating what appears to be such a trifling amount of the aforementioned fiberboard flavored flakes (alliteration anyone? 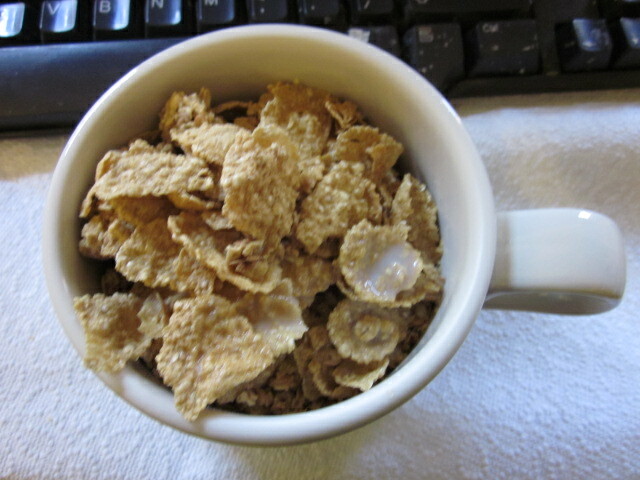 ), and 2) dousing it in skim milk! Please assure me you don’t use that insidious beverage to lighten your coffee. Mike, brace yourself, I’m a life-long black tea drinker — and not much of a breakfast, much less, a morning person over all. If I had my way, this nocturnal creature’s day would start no earlier than noon. The black tea aside, you sound like my son. Maybe you should try one of these fine items! Excellent idea you flowing fountain of pop culture Jules! I like the complimentary Valium idea to accompany adult-proof packaging. Samantha, when I suggested that idea, I thought it might strike a chord with my readership. Tee hee back at you. Ha! One of my bigger peeves along these lines was when Band-Aids had the little red string that you were supposed to pull to open the package. Not that the package itself ever gave me any trouble (simply rip to open), but it seemed a waste of good red string, since all that ever happened was one ended up pulling the string out of the package, leaving the package unopened. Baking soda boxes, too, where you’re supposed to push in the cardboard with your thumb, which only leaves a thumb sized depression in the box. Knives and scissors required. Little to-go salt packages that have written on them “Break Here” above a dotted line. Break? How can you break it? More ripping required, and salt flying everywhere (ok, not that much salt, but still). I sympathize with your milk carton endeavor. Thanks for the sympathy, but thanks even more for sharing these excellent examples of packaging peeves, Jeremy! I’ve blocked out of my mind how much I loathed every one you listed — especially that annoying, pointless red string in Band-Aid wrap that I could only get to work maybe one time out of ten. I opened the very same milk carton this morning. How is that possible? That’s easy to explain! You drew the short straw so you’ve been infected with the milk carton packaging blues, too, K. Packaging woes seem to be as common as the cold according to many of my insightful commenters. I have some arthritis in my hands (probably from mucking about in people’s mouths for 20 years as a dental hygienist) and I too find some of the packaging nowadays maddening. I wonder how many elderly folks waste away in their homes because their food was “sealed for their safety”? That’s a disturbing thought, but you’re probably very much onto something in of all places the sheer lunacy of Lame Adventures-land! Maybe the Boomer generation can lead the way for no-nonsense packaging? Their food, their medicine bottles; piling on blankets because the Catholic Charities-designated heating oil company doesn’t deliver on weekends … sheer lunacy: the sheer lunacy of society pointed out by Lame Adventures, I would say. But, uh-oh, my soapbox is starting to get rickety again. Be careful, especially if that’s a Wile E. Coyote preferred Acme brand soapbox! 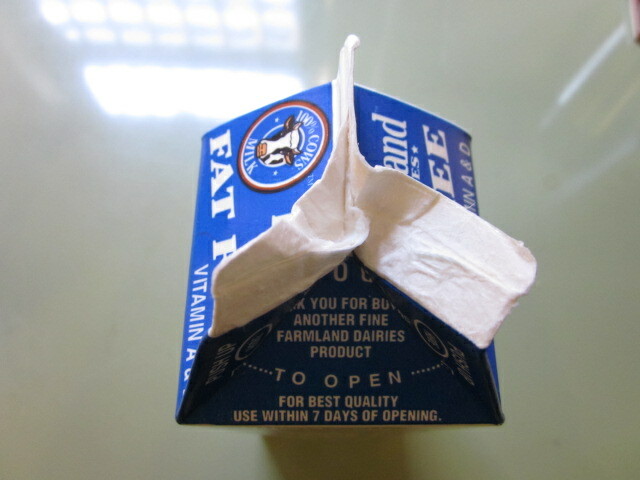 Hope you’re having a better day ….that is, without the “mope” uncooperative mini-milk carton. In general, Thursday is ALWAYS a better day than Monday, Jim. I see the bright lights of the weekend heading my way, unless that’s actually an oncoming train? Thanks for visiting Lame Adventures-land. P.S. that moody milk carton’s been behaving ever since I outted its antics. Well, I beg to differ as karma has placed its boot firmly up my rear this Thursday afternoon. I am writing to all readers to be aware of the poorly (in hindsight) named Weiner Roasted and Salted Peanuts. They are allegedly a *gourmet snack*. Well this afternoon they have become a snack for our office mouse. I did manage to scoop up about half the bag after it spilled all over the carpet in my office. However, the wheels of my chair ground quite a few into the fibers. The mouse will eat well tonight. I guess I should stay away from Mr. Weiner’s nuts in the future. Hey, Mike, let’s start a rumor that the Weiner Roasted and Salted Peanuts is the latest Anthony Weiner career move. Sorry to hear that your mishap with your gourmet peanuts has put a Monday-style damper on your Thursday, but yeah, that mouse should be in its bliss soon.